Sometime between 2:00AM and 9:00AM on the day He was crucified, Jesus was paraded into six different trials. Three were religious trials by the Jews and three were civil trials by the Romans. The Jews did not follow the scriptures or their own Talmud in these trials with Jesus. They also broke their laws by meeting at night, not producing witnesses, and not upholding their legal code with correct charges. The Romans followed their protocol and Criminal Code, but because of mob pressure, Pilate gave in and killed a man he declared innocent. We talk about following Jesus anywhere and everywhere with courage. But where are our limits? Would we have followed Jesus into trials where the laws were not being upheld, false accusations were created, and beatings and violence were used to intimidate and silence any other potential witnesses? Being misunderstood is difficult for any leader and being slandered is heartbreaking. I want to be willing to follow Jesus even when the laws of the land deny me justice and my friends desert me. That is where we find Jesus hours before His death, alone, abandoned by friends. He was helplessly deserted by any legal court although he was not charged. Jesus was declared innocent while walking on death row and there was no one willing to stop his execution. It’s easier to take risks and follow Jesus when you know your country or laws will protect you or rescue you. Those laws failed Jesus. There would be no rescue. How far you are willing to follow Jesus? 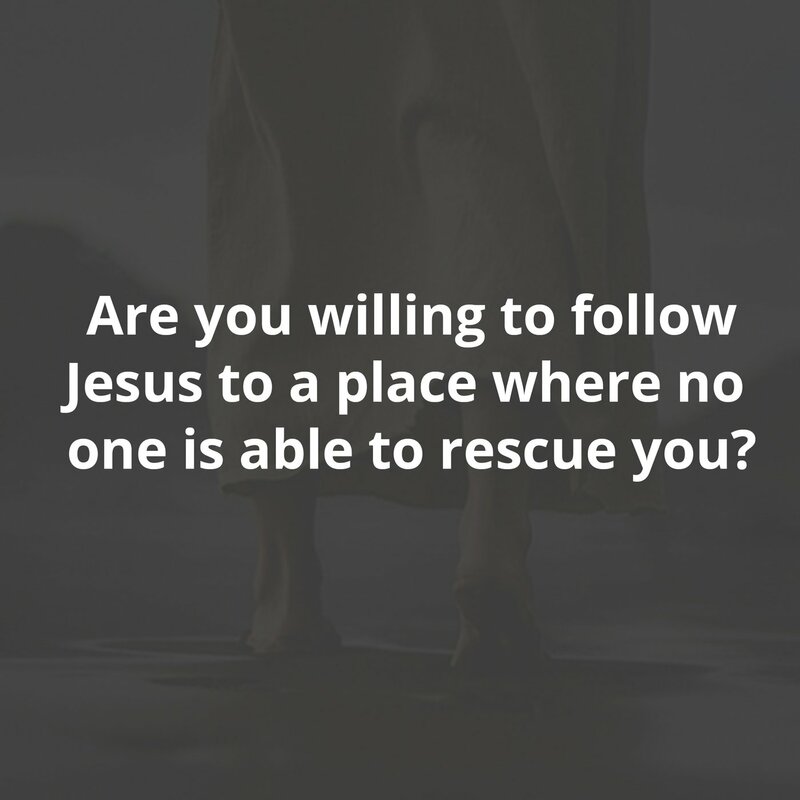 Are you willing to follow Him to a place where no one is able to rescue you? That is where Jesus had to go to be the necessary ingredient for our salvation.